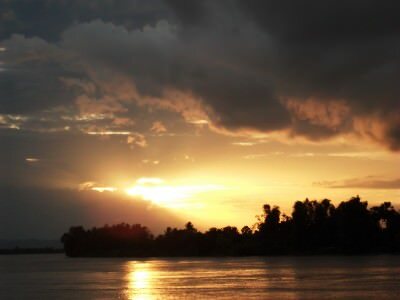 The sunsets over Don Det 4,000 islands in Southern Laos. The image that runs through your mind when you hear the words 4,000 islands is that it will be a place of tranquility and probable relaxation. I must admit that I hadn’t actually heard of the 4,000 Islands, or indeed Don Det until I ended up in Laos. 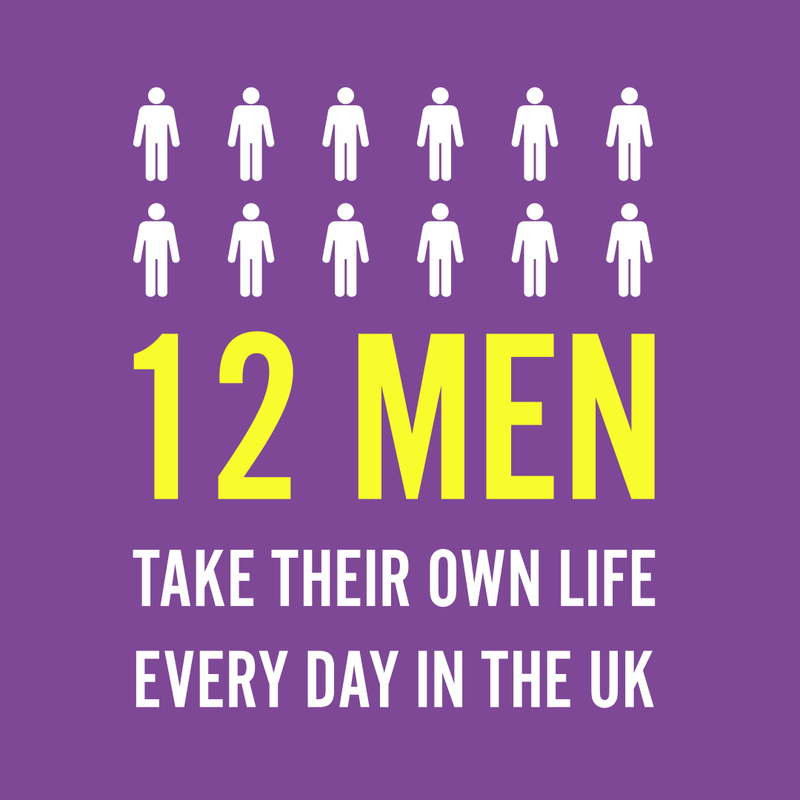 Laos will never rank that highly with me, from the scheming border officials, the rip off border mini-bus, the lack of friendliness at times and losing my camera and wallet in the Nam Song river while tubing in Vang Vieng (another story for another day). However this spot was where I spent my last night in Laos and in essence the most lazy, relaxing day of travel I have had for a long time. There are apparently 4,000 islands in this area, though I wouldn’t bother to count them. In southern Laos there are tons of islands, to the point where nobody knows the exact number so they just stuck an estimate of 4,000 Islands on it. How do you get to Don Det? Well the nearest big city or town is Pakse, where I had a three hour layover (that’s enough time to see the entire city believe me). My route was basically an immense sleeper nightbus from the capital city of Vientiane down to Pakse. My sleeper night bus from Vientiane to Pakse in LAOS. 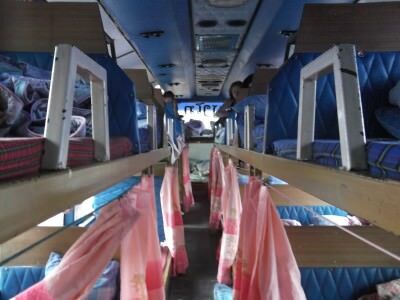 The nightbus included a free snack and a bottle of water and was a rocky trip – difficult to get sleep but just another amazing travel experience – I shared the four bed section at the back with 3 locals. Then in Pakse I boarded a smaller mini-bus which was clearly just full of tourists and backpackers. 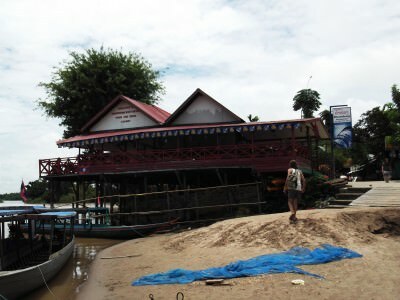 This took us down to Ban Nokhok which is a small village where boats run to Don Khong, the largest of the 4,000 islands. 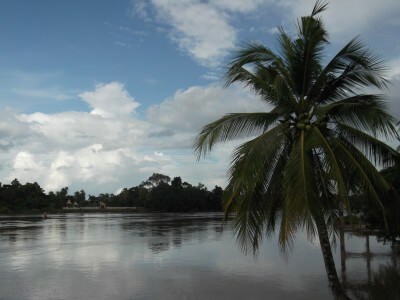 By the way the entire area is known locally as Si Phan Don (4,000 islands). Don Khong, the largest island even has an airfield strip on it for landings. View from my bus window near Don Khong, the largest of the 4,000 islands in LAOS. 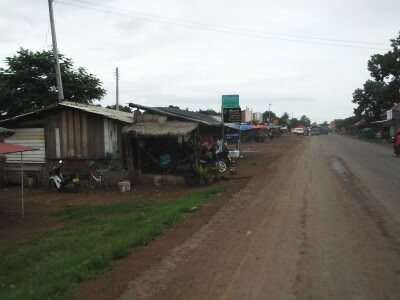 However we didn’t get off the mini-bus at Ban Nokhok or even visit Don Khong, we were headed further south. I was travelling with a lovely Irish couple from Cork, Helen and Anthony and they were just such great travel buddies – we planned our entire trips together for a week or so and we decided we would spend ONE night only in Don Det before heading across the border to Cambodia. It seemed perfect. 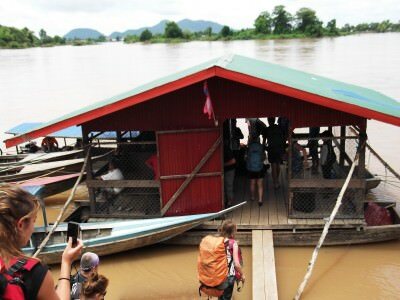 Boarding the boat in Ban Nakasang for Ban Hua Det, in essence the ‘capital’ of Don Det, Si Phan Don, LAOS. So to get to Don Det, our bus finally stopped off at Ban Nakasang, a small village of street, stalls, fishermen and markets. When we booked our bus ticket in Vientiane, the company included our boat connection in the ticket. We would board a boat from Ban Nakasang to Ban Hua Det in Don Det. Ban Hua Det is the ‘capital’ of Don Det if you like – the ferry port is there as are all the bars, restaurants and shops. It’s a small island. On the boat to Don Det. It left from a place called Ban Nakasang. The boat left without fuss, the water was murky and we piled onto the boat with all our backpacks and it was a bit crammed. By the way, you cannot really book any accommodation for Don Det in advance but you don’t need to. You won’t get stuck. It’s a remote island and on arrival at Ban Hua Det, you walk down the main street to find countless wooden huts and guesthouses. Arrival at Don Det is always by boat and normally to this sandy bank in the village known as Ban Hua Det. 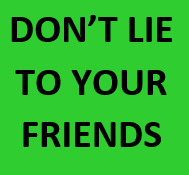 Bargain with them until you get a good price. I ended up with a double room for 25,000 Kip, though I know for sure I probably could have looked around and got one for about 15,000, but I got a room next to Helen and Anthony and had access to a shower and a mosquito net over my bed. I was here to relax and that I did! Downtown Ban Hua Det. Basically “where it’s at” on Don Det! After checking in and showering I headed to explore the island. There was no hot water here but a decent shower, I walked around part of the island for free – I was on a bit of a budget and almost had exactly enough Laos Kip to see me across the border into Cambodia. There was a girl from Downpatrick in Northern Ireland staying in the next room to me! She was Rebecca, travelling with her Scottish boyfriend. I had lunch with them and my Cork friends Helen and Anthony before having a walk round on my own. 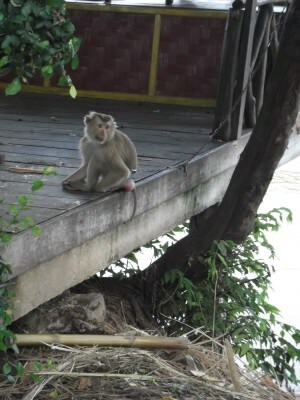 a lonely monkey in Don Det – there’s a bit of wildlife about. What is there to do in Don Det? That really depends on your budget. For me, I was happy to walk around, relax, update my travel notes, have a beer for sunset and a few snacks. One of the top sights to do is to go dolphin watching early morning to see the rare Irrawaddy dolphin. I didn’t do that, nor did I leave the island of Don Det – you can walk across a bridge to Don Khon which is a bigger island. There’s a Wat there as well as some waterfalls. I was being lazy and relaxed. There is a fee to cross the bridge to Don Khon (I assume this could be avoided if you go early morning or at night). 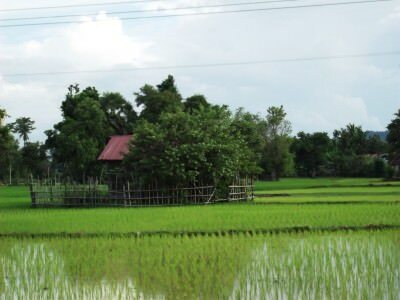 Rice fields in the centre of Don Det – for a budget backpacker a leisurely stroll is scenic enough! After seeing some pigs, chickens, monkeys and rice fields, it was time for a beer to watch the sunset. Relaxing with a Namkhong beer at Jonnee’s Restaurant in Don Det updating my travel notes. I sat on my own for it, updating my travel notes by the harbour in a bar called Jonnee’s Restaurant. 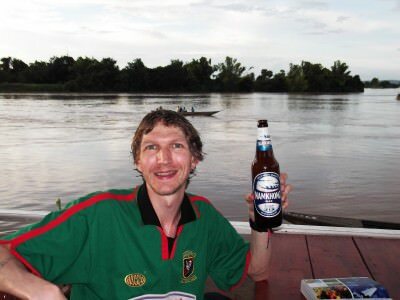 I drank a Namkhong beer there, my first time to try it and it would be my second last beer in Laos. The amazing sunset as viewed from Ban Hua Det in Don Det. Not a bad end to my less than inspiring visit to LAOS! The sunset was phenomenal. I sat alone just watching it before meeting up with Helen and Anthony for some food. Final beer with our gang in Don Det, Si Phan Don, 4,000 Islands, LAOS. 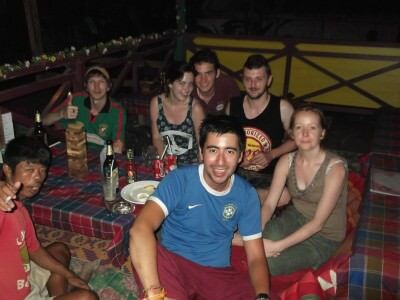 Before we slept there was time for a rendezvous and a final beer with Felipe Basaglia (a guy the others had met in Vang Vieng), Rebecca and Ian plus the Cork couple Helen and Anthony. Don Det is definitely WORTH a stop over if you’ve just come from Vientiane or Pakse, a great place to relax and build some real energy and enthusiasm for your onward journey. Quiet and remote and on reflection a lot better than I thought at the time. A decent night’s sleep followed before we boarded a boat back to Ban Nakasang and within hours I arrived in Cambodia. Why go there? 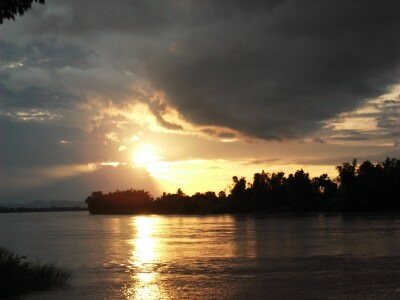 – Add it in as a place to stopover and relax if you’re heading between Laos and Cambodia – it will break up the journey and give you a bit of relaxation. A friend from University recently said “I loved Don Det, I could live there forever!” so it’s worth a look! Where to stay? 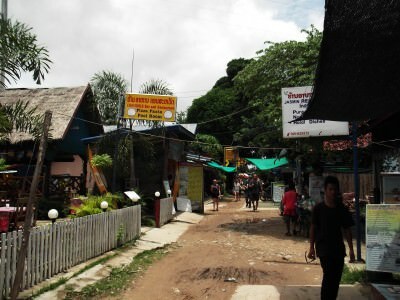 – On the main street in Ban Hua Det you’ll find loads of wooden huts and guesthouses. I stayed in a place called Welcome Cafe’s Guesthouse. 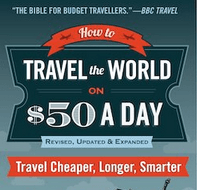 Don Det 4000 Islands is a post from Don’t Stop Living – a lifestyle of travel – I am a travelling Northern Irishman and I love going to new places. Leave a comment or ask a question if you like my website! This entry was posted in Asia, Don Det, Laos and tagged Cambodia, Don Det, Don Khong, Lao, Pakse, Pakxe, Vang Vieng, Vientiane. Bookmark the permalink. 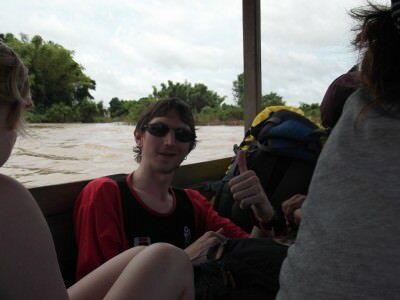 Pingback: Backpacking in Cambodia: Choeung Ek Genocidal Center - "Killing Fields"